Ask: Do you ever have a hard time obeying completely? I mean, maybe your teacher gives you an assignment but you only finished half of it. If you only do half of your homework does that count as completing it? Nope! Ask: Or what if your dad asks you to mow the grass but you only mow half the yard. Will your dad believe you when you said “But I did what you asked!”? No way! Say: We can’t get away with just following directions or obeying halfway. 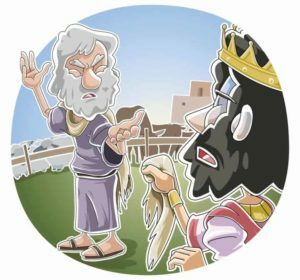 Our story today is about King Saul, and how he only partially obeyed God, but he learned that partial obedience is really just disobedience! Explain It (Book): This is where you school ‘em! Say: Last week we learned that God’s people (the Israelites) asked Samuel to anoint a king for them so they could be like all the other nations around them. By asking for a king they rejected God as their king. But God told Samuel to anoint a man to be Israel’s king. Say: That’s right. Saul became Israel’s first king, but unfortunately he didn’t turn out to be the perfect king that everyone had hoped for. He might have been a tall, strong, handsome guy, but his heart was sinful, and because of his sin, God would ultimately reject him as king! Say: One day Saul went out with his army to fight the Philistines. Saul wanted to offer a sacrifice before the battle so they could ask God for help. Only Samuel, the priest, could offer sacrifices but he wasn’t there yet. Saul waited and waited but Samuel didn’t show up. Finally, Saul became impatient so he offered the sacrifice himself. That might not seem like a big deal to us, but by offering a sacrifice Saul was actually disobeying God! Say: As soon as Saul had offered the sacrifice Samuel showed up. Let’s read from God’s Word to hear what Samuel said. “What have you done?” asked Samuel. Say: Awhile later Samuel sent a message to Saul telling him to go up and fight against their enemies, the Amalekites. Through Samuel, God told Saul to completely destroy all the people and their animals. Saul and his army went out against the Amalekites like God said, and they did defeat them, but they didn’t obey God completely. Saul allowed the Amalekite king, Agag to live, as well as some of their animals. Say: Saul was proud of himself for obeying God, even though he hadn’t actually obeyed at all! Partial obedience is disobedience in God’s eyes. Say: Saul was very sorry that he had sinned against God, and God was sorry He had made Saul king. Say: It’s not hard to see that Saul wasn’t perfect. He wasn’t a perfect king and he wasn’t a perfect person because his heart was sinful. Really, you and I aren’t all that different from Saul. Maybe we wouldn’t have made exactly the same mistakes that he did, but we probably would’ve made our own mistakes! Say: Do you remember our lesson last week? Israel demanded a king and Samuel warned them that any human king wouldn’t be able to truly take care of them. Any earthly king would fail them because all people are sinful! What the people really needed was a heavenly king; someone who would rule over them with love and justice. Back in Saul’s day the people were still waiting for that perfect king. But guess what! The wait is over! Our perfect King is here. His name is Jesus, and He is the long-awaited king and messiah that God’s people were hoping for. Say: God used earthly kings to show His people that what they really needed only He could give them. The people wanted justice, but all their kings were selfish at heart. The people wanted peace, but their kings faced many wars. The people wanted comfort, but because their sinful kings led them away from God, the people were punished for their sin! Say: Jesus is the only King who can truly provide for us and care for us the way we need Him to. How might we live differently in light of the truths in this story? Tony Kummer (Editor) reviewed & updated this page on : September 13, 2017 at 5:40 pm. All our content is peer reviewed by our readers, simply leave a comment on any post suggest an update.